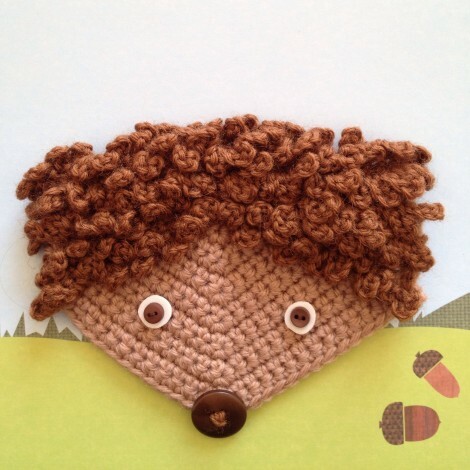 You will need to make 2 triangles in dark brown for the purse pocket (this is the shape given for the Head in the original Fox pattern), and below is the pattern for the hedgehog-y Head, to be used as the purse flap. UK crochet terms used throughout. With a 3.5mm (US E/4) hook and light brown DK yarn, follow the Head pattern of the Fox until the point where you dc along the top straight edge of the triangle. Fasten off the light brown yarn, and join dark brown DK into the first st of the top edge. Row 1 (RS) Ch1 (does not count as st), work 1 row of double crochet evenly along the top straight edge, turn. Row 2 Ch1 (does not count as st), dc in the front loop only of each st across, turn. Row 3 Ss in first loop, (ch6, ss in next loop) repeat to end of row, turn. Row 4 Ch1 (does not count as st), dc in the front loop only of each st across, turn. Row 5 As Row 3, working in the remaining loops of each st from Row 2. For the following two rows, you will be working across the central stitches of the head only. Calculate half of the number of stitches across the Head, and identify that number of stitches in the centre of the Head. For example, if there are 24 sts in your Row 4, half is 12, and in order to position those 12 sts centrally, you will need to skip the first 6 sts, work 12 sts, and skip the last 6 sts. If you have an odd number of sts it won’t quite work out evenly so as to be exactly symmetrical, but it won’t show on the finished Head. Either fasten off your dark brown yarn and rejoin it in the first st you will be working on the next row, or slip st in each st across to the point where you will begin working. Working this extra half row in the centre rounds off the shape of the Head a little bit, so that it isn’t so flat. Rows 6 and 7 Repeat Rows 4 and 5 working on the central sts only, and working in the remaining loops of Row 4 for Row 7, fasten off and weave in ends. At this point, you will have a light brown triangle with 2½ rows of chain loops for spines across the top. In order to round out the face, you need to work more spines on the light brown triangle. 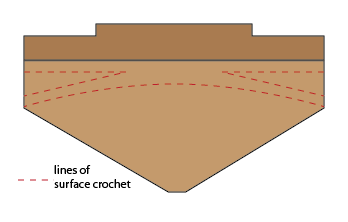 To do this, first work lines of slip stitch surface crochet as shown on the diagram below. Then repeat Row 3 to make the spines, inserting your hook underneath both strands of the ss loop on the surface of the triangle for each st.
Hmm..this does look a bit like a pair of y-fronts! Now all that remains is to add the eyes – I used small circles of white felt and tiny brown buttons – and a button for the nose. Coming in Part 2 – a host of hedgehog ideas!